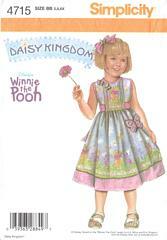 Dress pattern from the Daisy Kingdom Disney's Winnie the Pooh series. Sleeveless dress with raised waistline, tuck interests on bodice and back ties. Neckline and sleeves are finished with self fabric bias binding. 12" back zipper closing. Pattern is uncut and complete. Envelope has no flap.